On the four-hour chart Tenkan-sen and Kijun-sen lines have almost merged under the cloud. 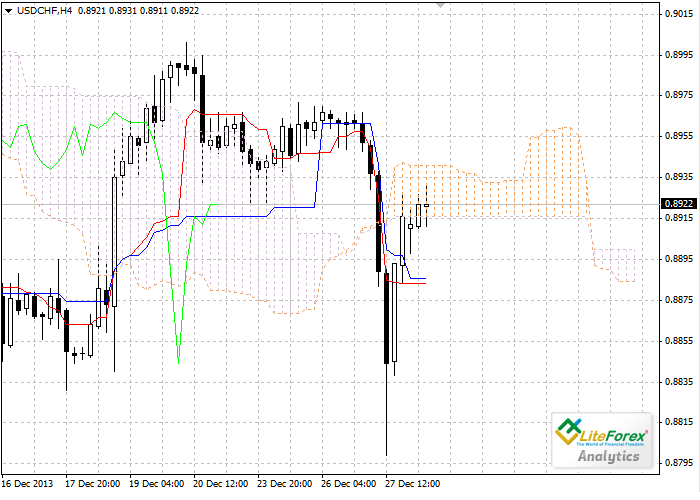 Chinkou Span line is approaching the price chart from below; current cloud is descending. 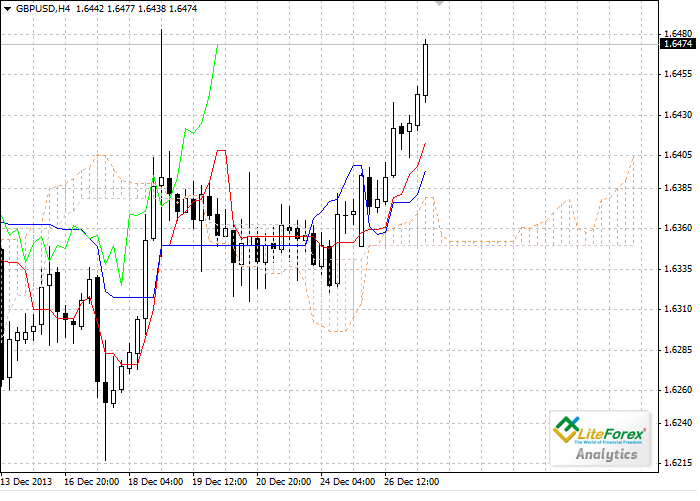 Last week the pair brake down the cloud, but today it has returned within the cloud’s borders, which become support (0.8916) and resistance(0.8941) levels. At the beginning of the trading week the pair demonstrated uptrend in the sideways channel. However, taking into account Christmas holidays and lack of macro-economic data, we should not expect changes in the exchange rate of the pair. It such case it makes sense to rely on the technical indicators. Last Friday the pair continued to go down slowly amid fundamental facts. Rating agency S&P downgraded the rating of EU from the highest AAA to AA+ with the stable forecast, which could not but affect the rate of European currency. At the end of last week the pair reached the level of 1.3620 but managed to consolidate below resistance level of 1.3700. Ever since the US Open Market Committee adopted the decision to reduce quantitative easing programs from 85 billion USD to 75 billion dollars, the chart of the pair NZD/USD has been demonstrating downtrend. GBP/USD: red rag for the “bulls” or sweet honey for the “bears”? The pair USD/JPY is growing today due to the negative Japanese stats. Trade balance deficit has reached the level of 1,29 trillion yen. From one hand, increase of the import indicates the growth of the demand first of all demand for energy products. From the other hand, capital inflow from retail sales decreases, affecting national economy.